Birding Is Fun! : BiF Contributor Contributes to New Book! BirdingIsFun.com contributor Kathie Brown, has returned to the Tucson Arizona area where she birds, blogs, photographs, and writes poetry. For a couple of years she lived in the northeastern United States and contributed greatly to local birding, especially as a fantastic eBirder. As author Susan Hegarty was writing her book, she contacted Kathie requesting assistance, asking her to share her eBird data for the area. Kathie's contribution earned her an acknowledgement and a mention of her blog in the book. In the acknowledgements she writes, "I am grateful to Kathie Brown of Kathie's Birds for her impressive list of bird species in Den Rock's Beaver Pond." 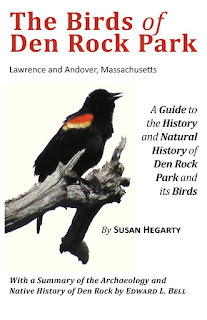 If you have an interest in the Lawrence and Andover, Massachusetts region, and especially its birds, please check out The Birds of Den Rock Park. Congratulations to Kathie Brown! We're proud to have you on our BiF Team, proud to know that your eBirding has supplemented a new birding book, and happy to share with the world that you are one awesome lady. 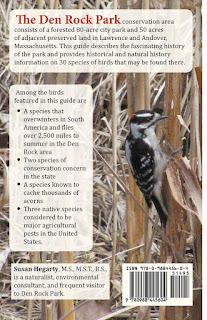 It just goes to show us all the eBirding a local patch is important. The data is useful. You may even be asked to contribute to a book some day. Congrats Kathie!!! That is really exciting!